Remember that Darth Vader vs. The Energizer Bunny commercial from a couple years back? Ol' Darth went to attack everybody's favorite battery mascot, then discovered that the bargain batteries he had used in his lightsaber were fizzling out. That's how Jedi Power Battles feels. There are some enemies that you can hack on all day long, and never really feel like you're doing any damage. I realize there needs to be some game balancing and lightsabers can't be allowed to slice through everything if the game is going to be in any way difficult, but there are better ways to balance the powers of the lightsaber than reducing it to the effectiveness of a butter knife. In fact, the designers seemed to realize this and included enemies with rocket launchers which cannot be deflected like your standard blaster bolts. Seeing more of this kind of design would have increased the coolness of swinging a lightsaber ten fold. When that elegant weapon from a more civilized age connects with a battle droid, you want that bucket of bolts to sizzle... not stand there and await three more hits. Cowardly Jedi take to the roofs. The two-player mode, while praised above, does lack somewhat. If one player should fall off of the screen, they will die after a few seconds. Now, don't misunderstand me here. I do not mean that they fall to their death they lose a life. I mean if Player 1 runs faster than Player 2, and Player 2 falls behind, then Player 2 will die after a few seconds of not being on-screen. This tends to happen quite a bit on accident as lightsaber duels get fast and frantic and one player ends up on one side of the screen while the other player ends up on the opposite side of the screen. It would have been much better if the camera simply zoomed out or, even better, if there were no way for either player to ever leave the screen. The enemy AI is simplistic at best, which is really to be expected in this style of game, but it is a bit noticeable at points. 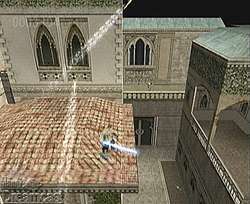 You will sometimes see enemies standing directly below the ledge you are standing on, running into the wall as if they will eventually make it to you. Other times you can throw a thermal detonator at one enemy, nearly killing him, only to have the one standing beside him never react at all. Finally, the levels do lack in some places. There are a few bits of camera positioning and enemy placement that it seems as if a couple more weeks of polish would have fixed. In other spots the art is lacking, which is surprising because most of the game is really pretty to look at. Like I said at the beginning, this is a game that follows the film in spirit. It has its glorious moments and it has its "what the hell were they thinking" moments. 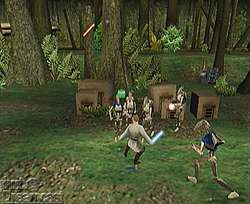 In the end Jedi Power Battles succeeds because it is proud to be the simplistically designed hack and slash button slapping fest that it is. This is not the best action title available for the Dreamcast, but it's certainly not the worst, either. Highs: Pretty graphics most of the time, good level design most of the time, it's Star Wars -- that counts for something, right? Lows: For every moment of greatness there is a moment of not-so greatness. There are always two. A Master and a Pupil. A... Oops. Sorry about that. Other: 1 player, VMU Compatible (16 Blocks), Jump Pack Compatible.